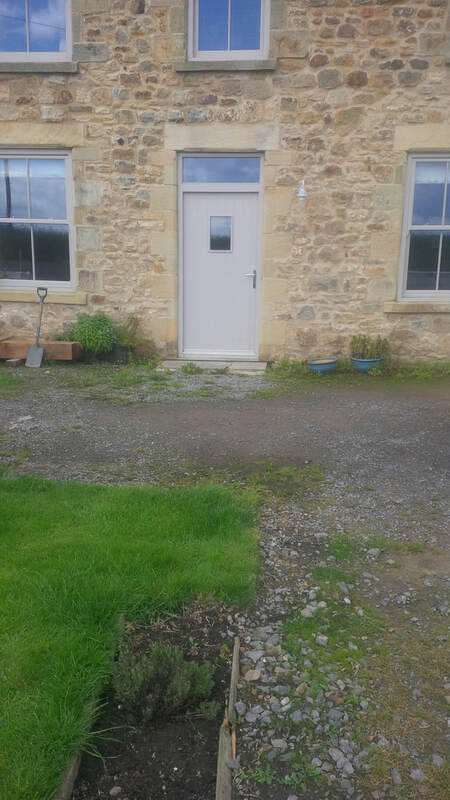 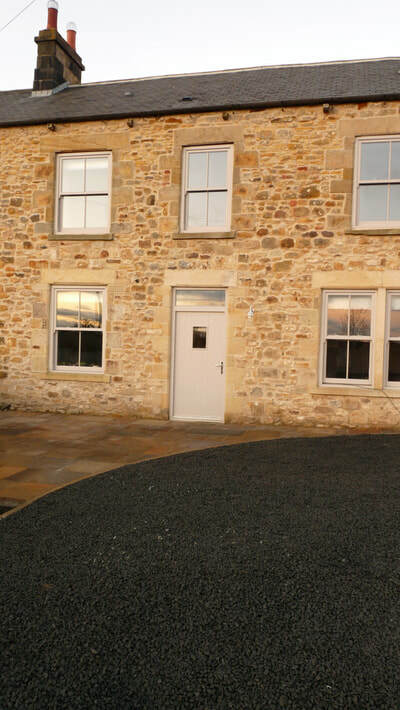 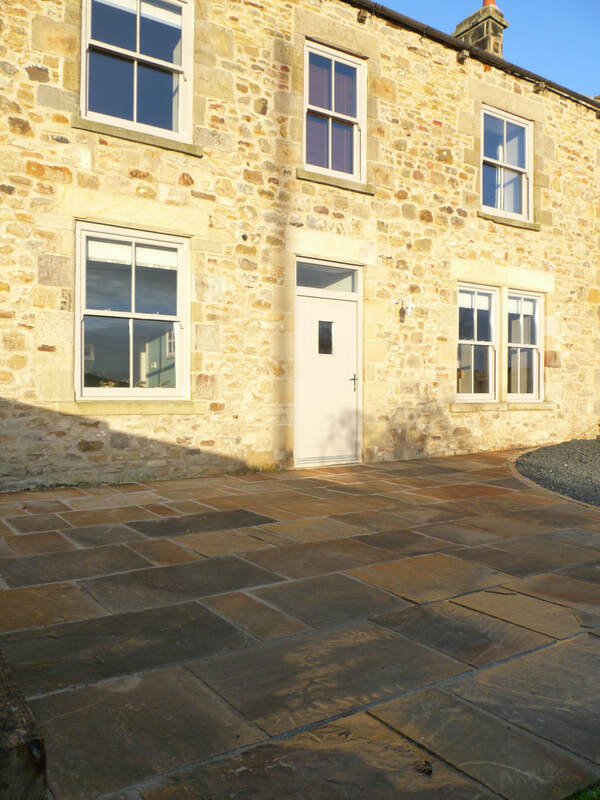 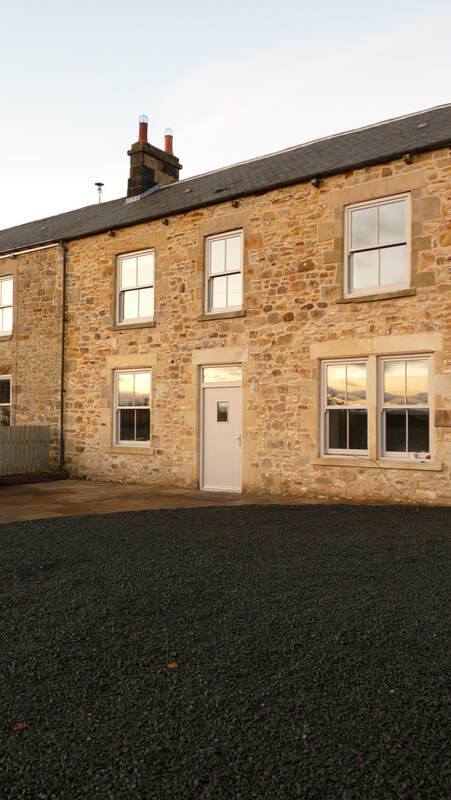 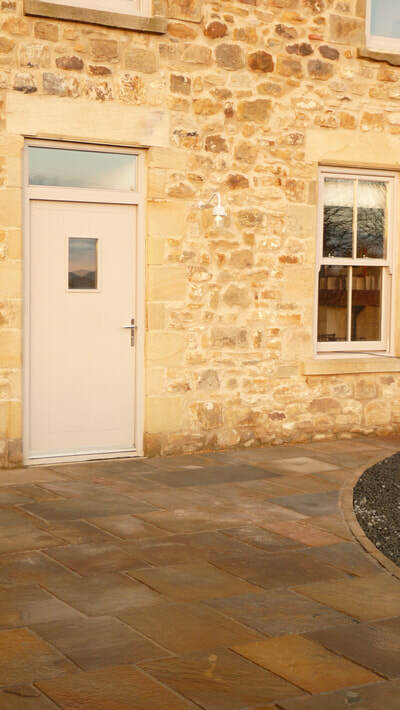 The owners of this lovely old Northumbrian farmhouse had spent a couple of years refurbishing the property and having made a beautiful job of the interior wanted to keep the mud out of the house! 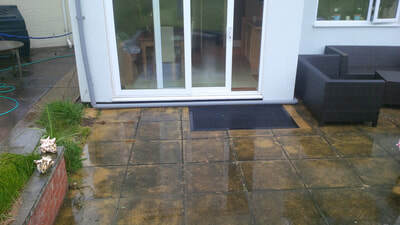 The brief was simple; to create a patio area on which to be able to sit out and have sufficient space to park five or six cars - so as the patio may occasionally need to pressed into service as parking space it would need to be strong. As ever, the key is to keep things simple - in this case both design and material choice were fairly self-evident. The outcome? 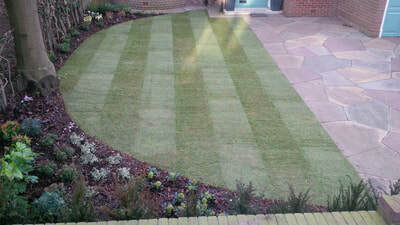 Satisfaction all round! This small Gosforth garden was refreshed with limestone cobbles, a simple replanting scheme, and a new timber gate to match the door. This work is standard fare, but we still spend time with customers to advise and inform, and make sure we create the garden they want. 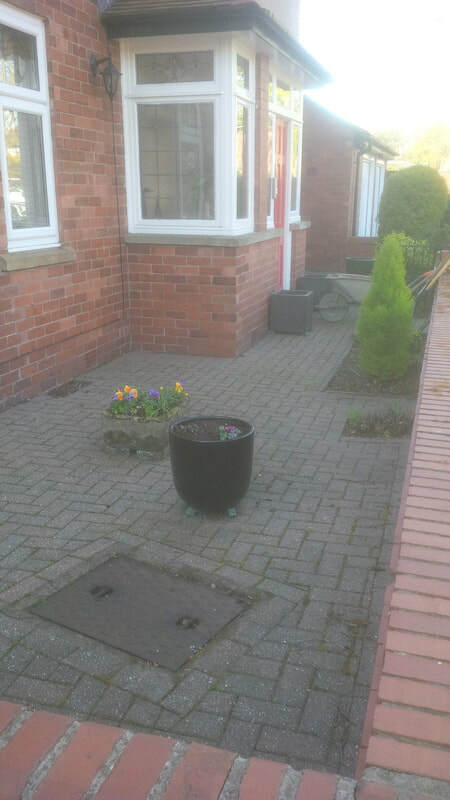 We were asked to replace some tired block paving and improve the size and shape of the planting beds, we opted for sandstone and curves, replacing the manhole cover with a more subtle recessed tray.and the gulley pots to alleviate persistent drainage problems. An absolutely cold-blooded, ruthless professional may claim never to have favourites, but now and again you get a job that has that extra something. That was the case with this job. The garden was set across a footpath from the terraced house, so it is the landscape; the main view from indoors. 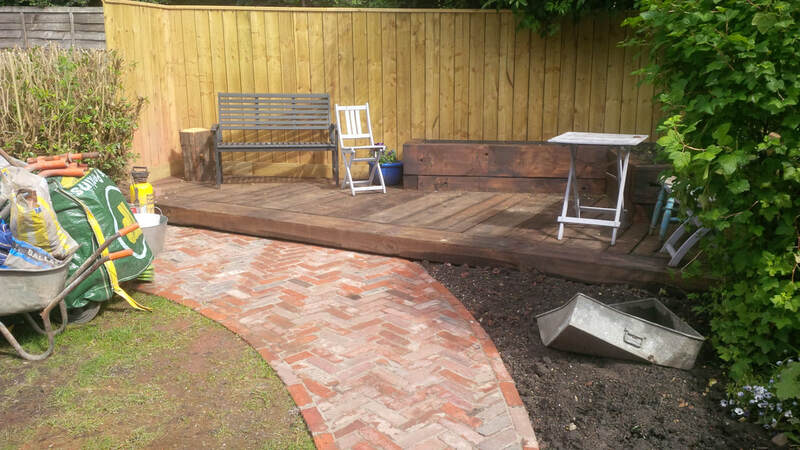 The brief was to create a simple space which used reclaimed materials, reflected the industrial heritage and caught the sun at the end of the garden. Unusually, the design was done at the customers kitchen table, from start to finish, in just twenty minutes. Our customers had a beautiful extension to the side and rear of their Gosforth home with new bi-folding doors fitted to a large living area. 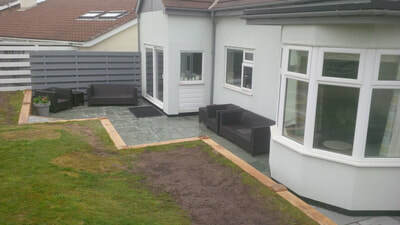 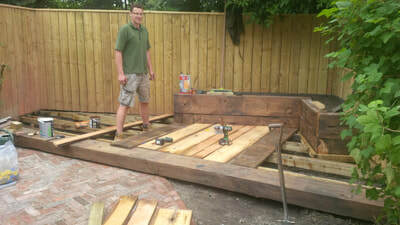 The brief was to design a small deck linking house and garden; with space for bistro table and chairs, continuing the dark flooring of the kitchen out to the garden using eco-friendly timber. 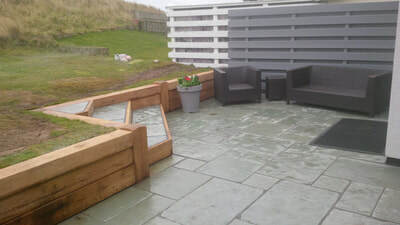 We suggested Kebony® and designed a deck with curves and a chord-step. 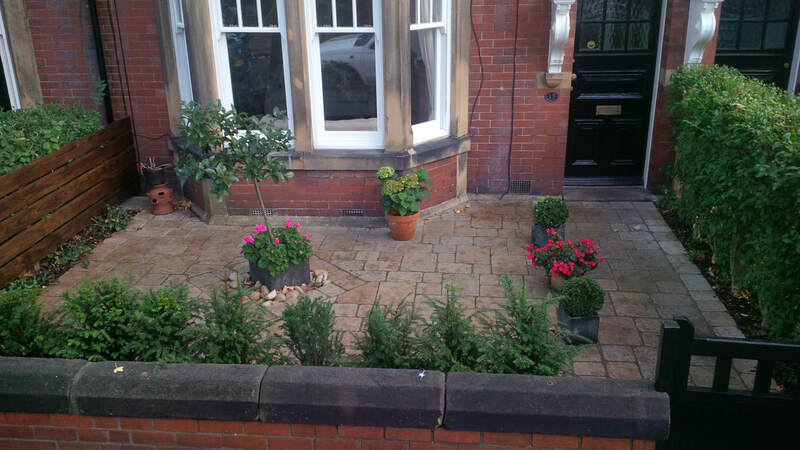 This Jesmond yard looked beautiful with all of its pots of shrubs and flowers, but the owner felt that the paving was letting it down. 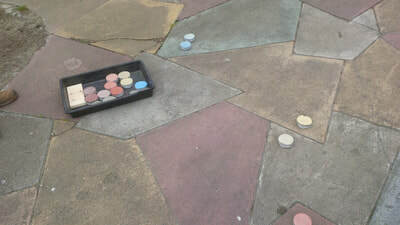 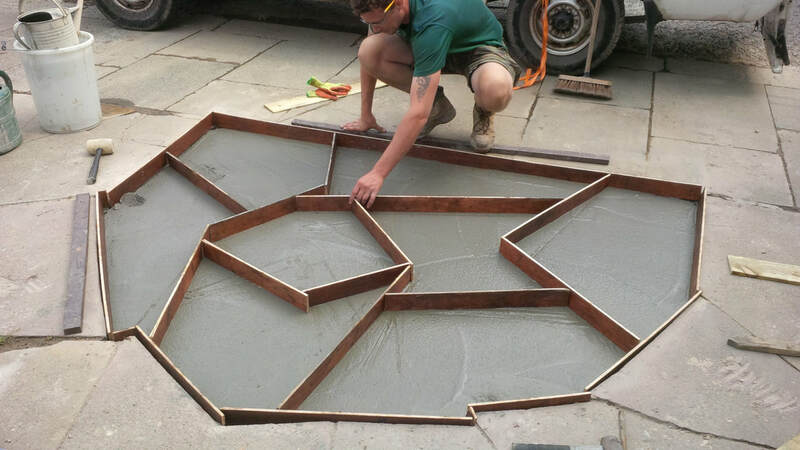 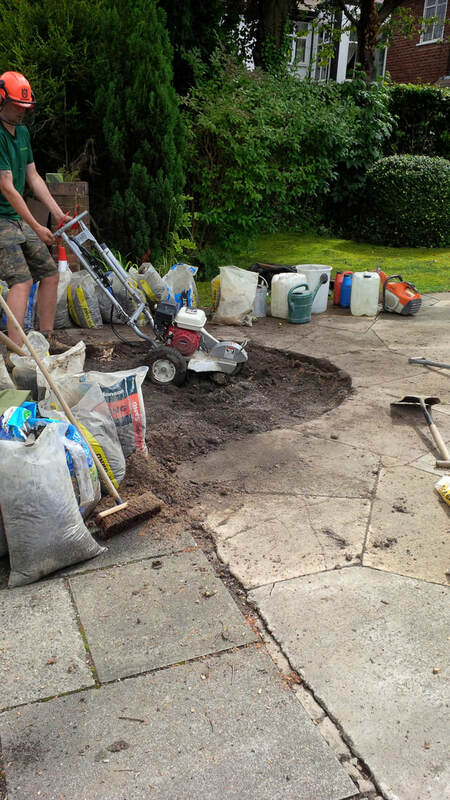 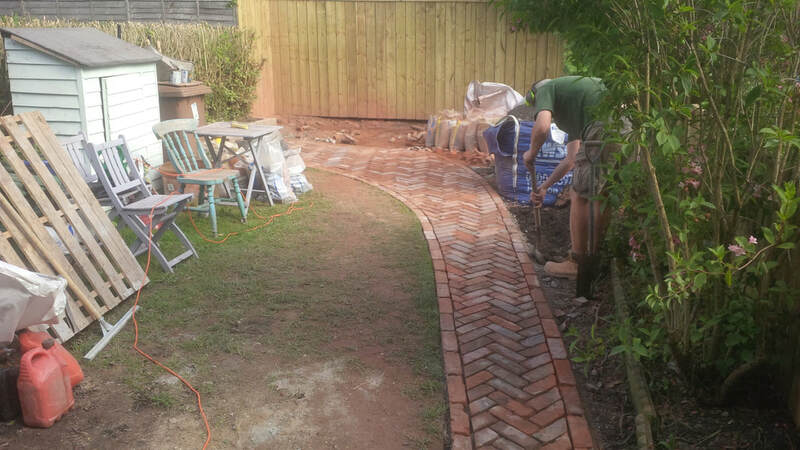 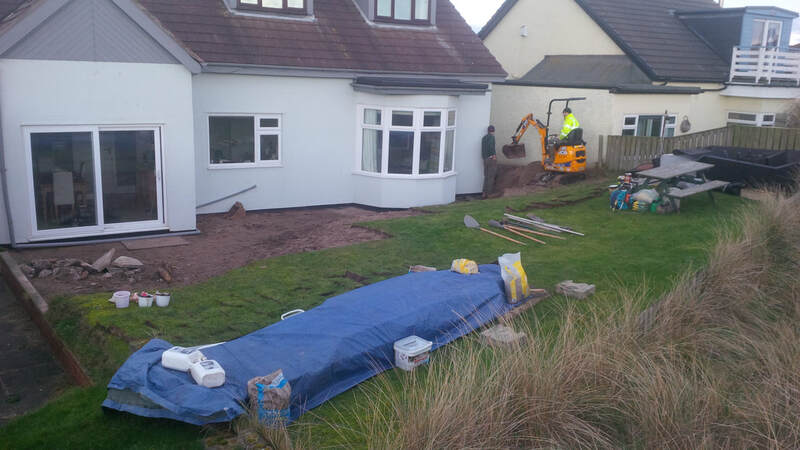 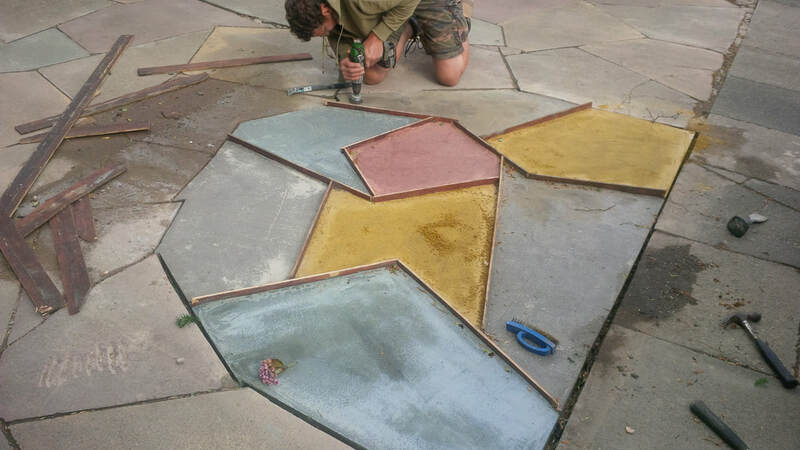 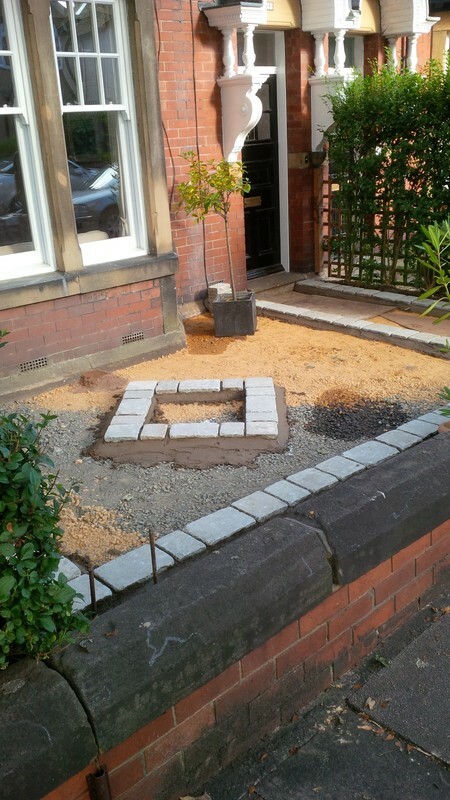 We broke out the concrete and made some drainage improvements before laying the new tegula block paving. 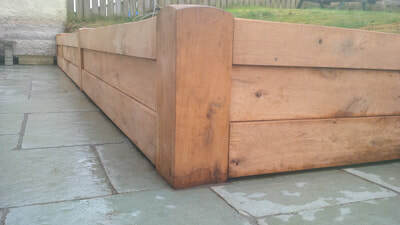 To add an extra spark we had the old bench ends blasted and powder coated and replaced the decaying timber slats with teak, finishing them off with a couple of coats of oil. 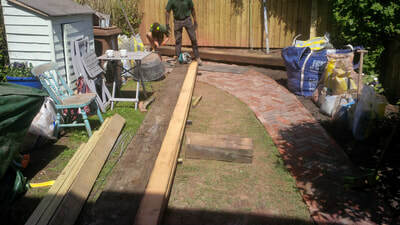 No two projects are ever the same, but this was an unusual one by any standards. 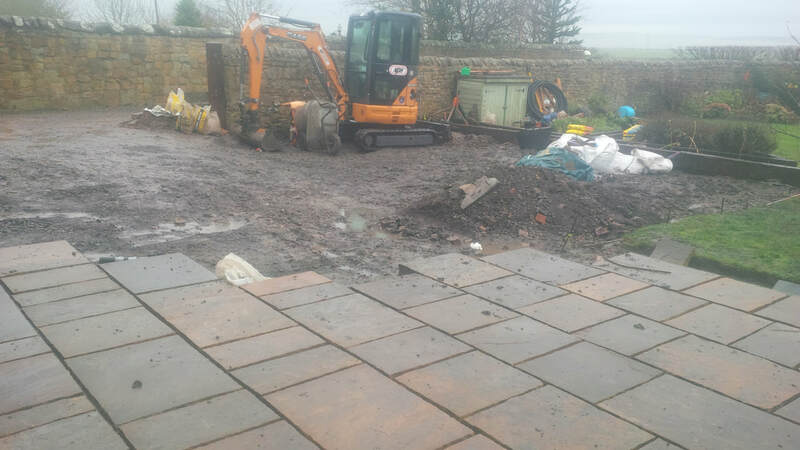 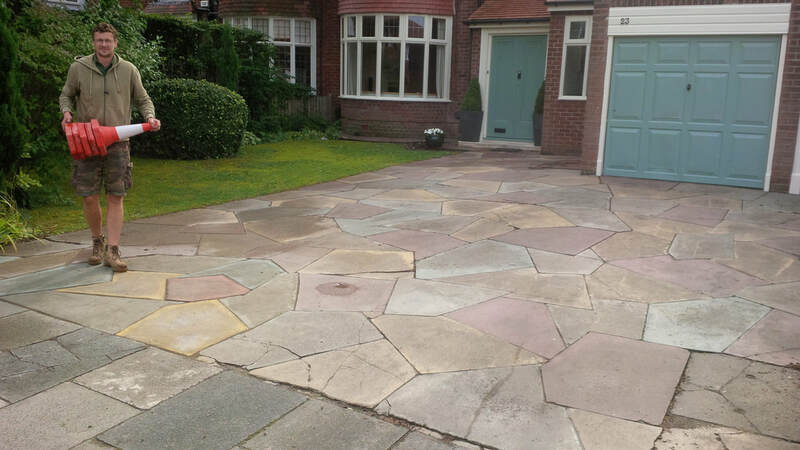 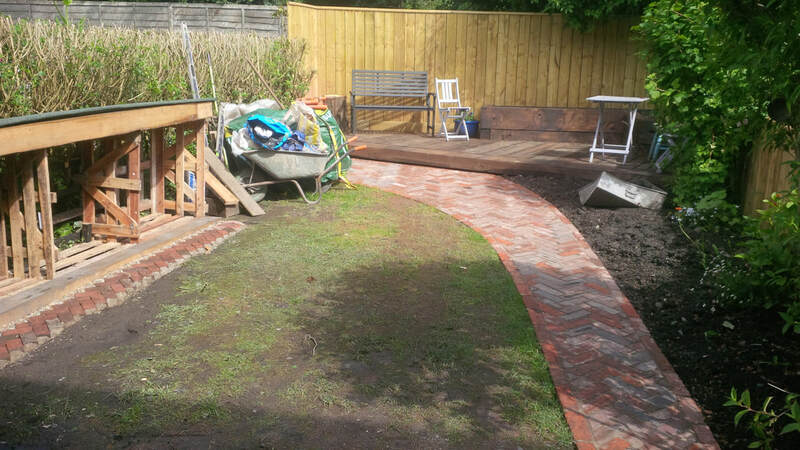 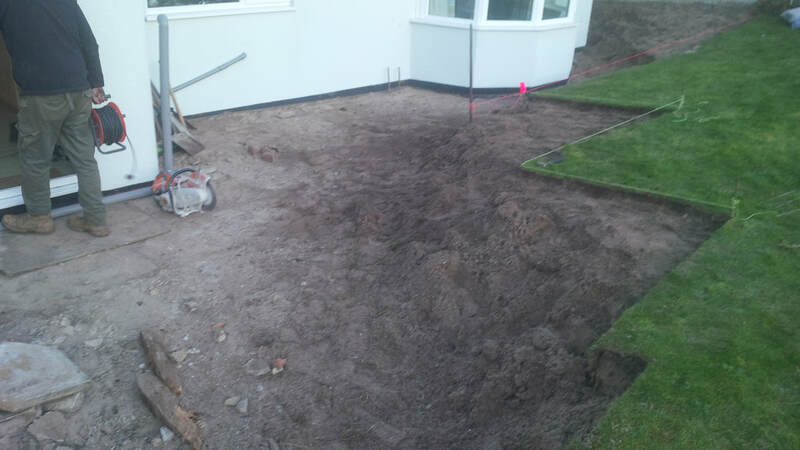 A large tree had been removed leaving a gap on the driveway, the customer asked initially whether we could fill it with block paviours, but we decided to set ourselves a challenge. 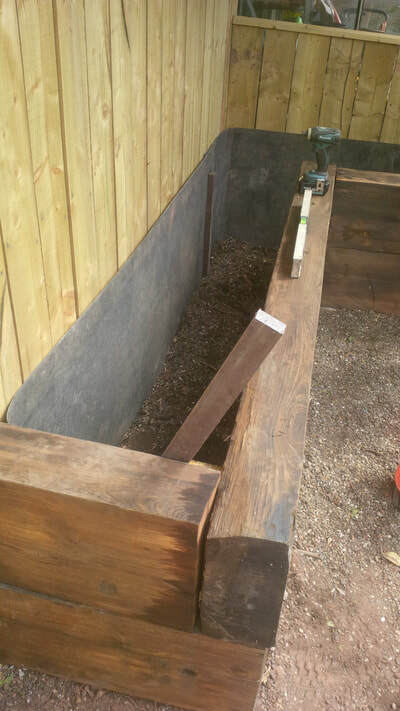 We finished grinding out the stump, set about mixing various concrete recipes to get colour matches, made up some formwork, poured the concrete and then set about some serious rapid ageing to blend the new with the old. 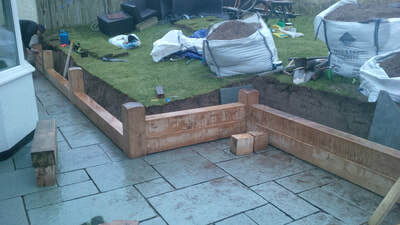 With that out of the way we got on with replanting and turfing the garden. 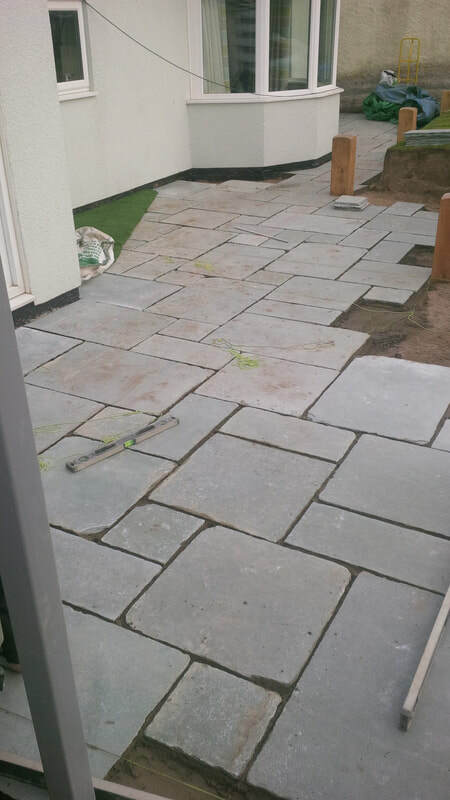 This was one of those very rare jobs in that here was a customer who had given considerable forethought and knew exactly what he wanted. 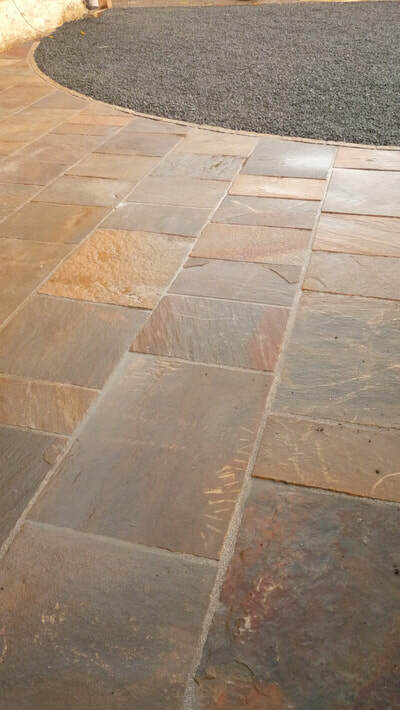 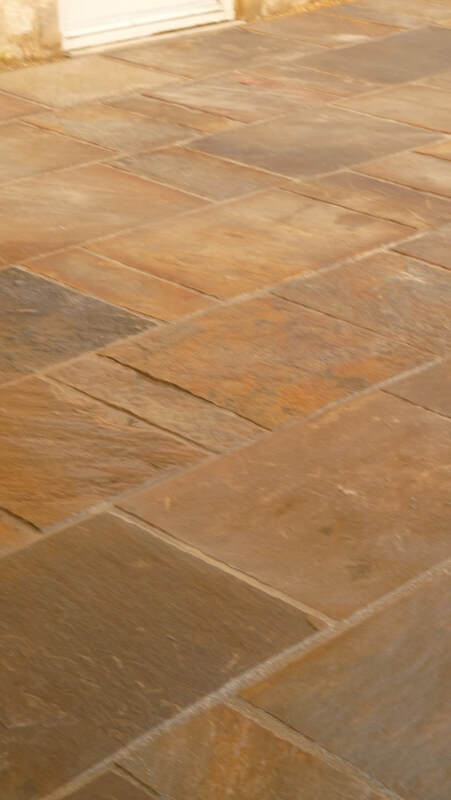 The only thing we needed to do in the design phase was to listen, take notes, and offer a choice of stone! 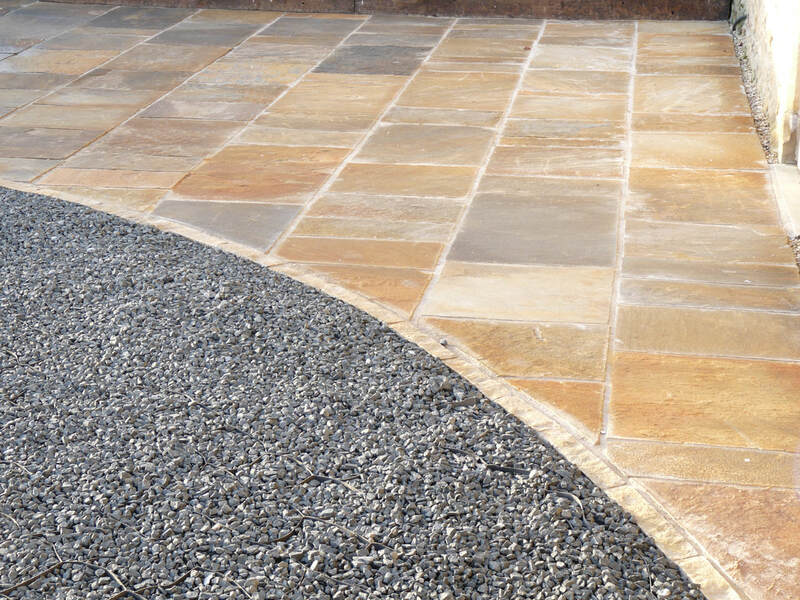 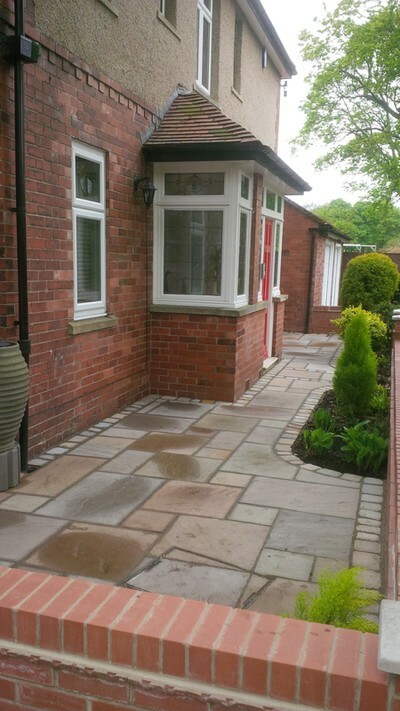 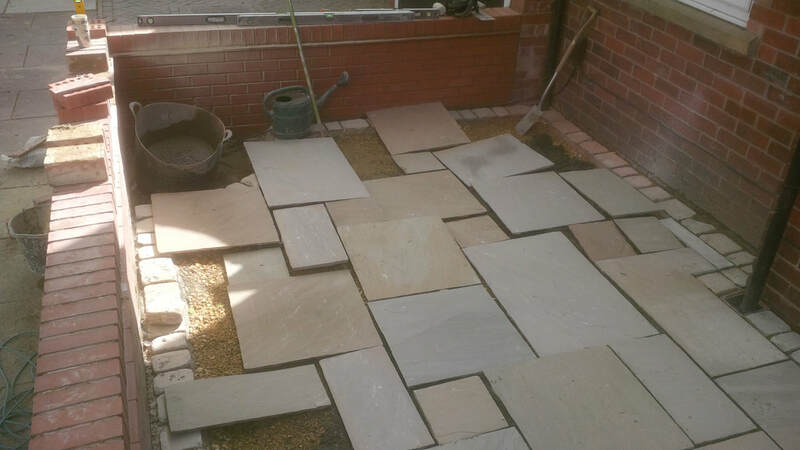 We created a more private and secure courtyard garden with a new fence and stable-door gate, paved with sawn Yorkstone flags and cobbles (photos taken before the customer added furniture and pots). 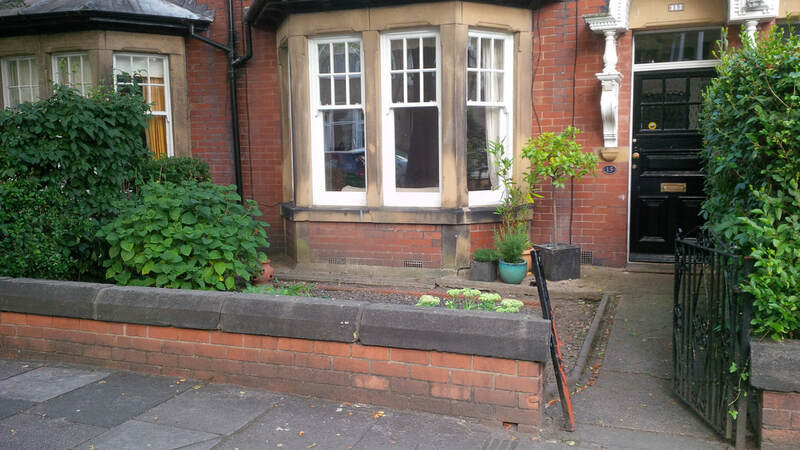 On the face of it this was a fairly simple job, to smarten up the entrance to this Jesmond home, the slight complication was the antiquated method of moving rainwater from the roof to the road, which caused some decay to the base of the timber porch. We made repairs to the porch, and, using clay pavers, formed a channel to the side of the new limestone path to move the water away. 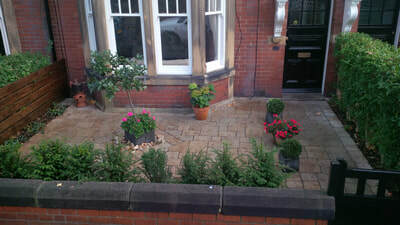 With borders and vegetation attended to the property gained huge 'kerb appeal'. It's not often we get out of town, but this job took us up to the beautiful north Northumberland coast, sadly we weren't able to schedule it in to enjoy the warmth of summer, but being set in the dunes it was, nevertheless, a beautiful place to work. 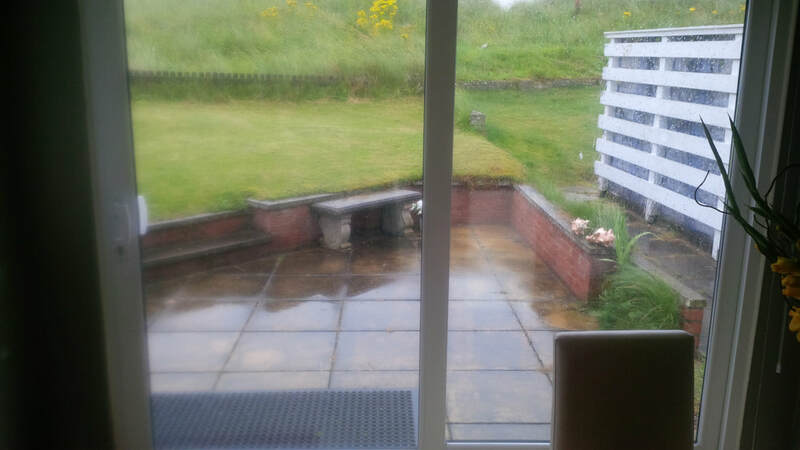 The dunes are not static and picket fences were half buried and gardens part-filled. Ideally we'd have returned the sand to the dune, but this may well be considered anti-social so we dug out and carted away a few tons of sand, along with the old wall and paving. 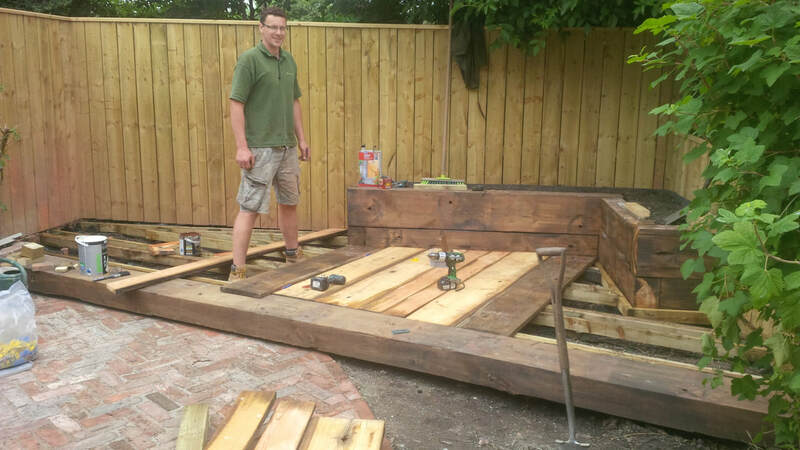 We extended the patio area and created a retaining wall from dressed oak, recessing the centre 'panel' to add a little finesse and rounded off the tops of the oak posts to give them a slight nautical feel.